We engineer our heating systems to improve your energy efficiency, cut out heat loss, and save you money on your bills. Our heating systems for industrial buildings can be designed to provide warmth for employees or to keep stock at a certain temperature. Industrial premises like warehouses, factories and distribution centres are some of the toughest of all buildings in which to maintain a regulated temperature without breaking the bank. Items such as machinery and forlikfts give off air pollution and heat. At the same time door openings may allow heat to escape. It all makes for constantly shifting temperatures – this can affect how well your employees operate and the condition of warehouse stock. 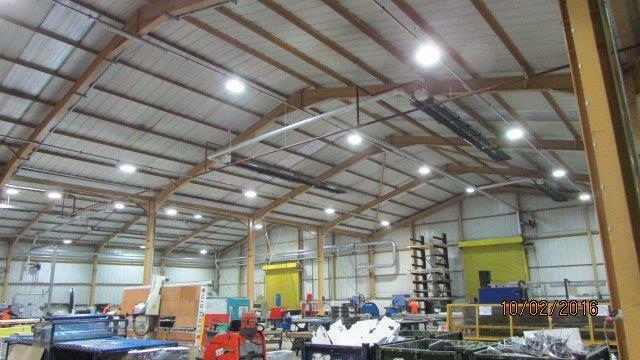 Our heating solutions enable you to maintain an even distribution of warmth within a large industrial space – or to focus heat within certain areas for maximum energy efficiency, depending on your requirements. And we can ensure that minimal heat is lost using methods such as air curtains. That way the heat that you are paying for isn’t being wasted. Give us a call and we can arrange for a free initial site survey. With industrial premises we typically use a combination of heating, control units, and ventilation systems. Together they allow you to improve air quality for the benefit of your employees and manage the temperature within your factory or warehouse. 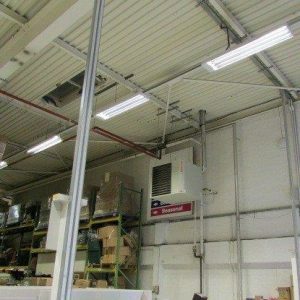 Warm air space heating systems or radiant tube heaters are the basic solutions for industrial sites. The choice of one or the other will depend on whether you need to heat specific areas within the premises such as work stations and points on the production line. In this case radiant tube heaters are ideal – they heat people working near them, rather than whole areas, so there’s no unnecessary waste of energy or fuel. Warm air systems are more effective if you’re working from an industrial property such as a large retail unit or warehouse. The heating systems provide a constant temperature across a large area, making them useful for rooms holding stock. They can be both floor-mounted or suspended. It’s an excellent way of improving your fuel-efficiency and saving on your bills. Suspending the heaters means they don’t take up storage space or get in the way of moving trucks. When combined with air curtains and destratification fans you have an enclosed and heated space in which to work. The destratification fans take warm air that rises from the heaters and forces it down again. So you recycle the warm air rather than having to pay for more heat. 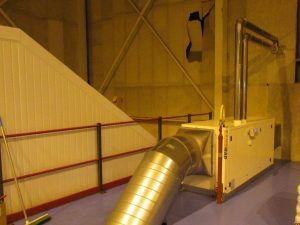 The Air Curtains provide a blast of ambient or warm air over a door opening operated by automatic switch control when the door is opened to block the cold air from coming into the building …..this is really useful in an area where forklifts operate and doors are frequently opened.